By LUDWIG VON KOOPA - You fixed your last faucet you revolutionary pipesqueak! You know, this is NOT supposed to be “beloved old things are dying” week, but yesterday we wrote about MS Paint being deprecated. 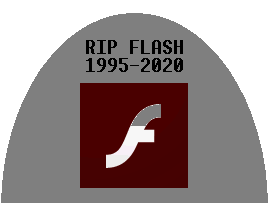 Today, Adobe announced that Flash, once a bedrock of the Internet, will no longer be supported by 2020, and has set Flash to an end-of-life death journey. Adobe has specified this applies to Adobe Flash Player, and not other things using the Flash runtime, such as Adobe AIR. That's particularly important to us at KoopaTV right now on a game development basis. The animation to the music is made by 2000s-era Internet celebrity Kirbopher, while the actual lyrics were by a dude named Martin Hagwell. Rawest Forest is what many people's overall concept of Super Mario RPG: Legend of the Seven Stars was. You take the best song from Super Mario RPG (Forest Maze, otherwise known as Beware the Forest's Mushrooms) and then make it seem like the whole game is like that, and put lyrics to it. For YEARS, this song, along with the Internet's overall love for the character Geno, was pretty much all I knew about Super Mario RPG. I assumed it was this amazing cult classic game. Finally, on Labor Day weekend 2008, it was released for the Wii's Virtual Console. And... it turned out that Forest Maze really was the best part of the game, and the rest of it was overrated. At least the song is still a classic! My personal favourite of the songs in this article, it's Ignorance is Bliss! This is actually a very old, officially-licensed Nintendo song by the long-dead band Jellyfish, back in the 1991 compilation album Nintendo: White Knuckle Scorin'. Unfortunately, it's no longer available on Newgrounds (it was animated by a lad named Brandon Clark), but here is a mirror of the Flash video on YouTube. The basis of the song, its movie video, and the included comic in the album is that King Bowser Koopa has taken over an oil field and is going to be a part of an oil cartel for big-league profits. Princess Peach doubts the Koopa's ability to pull that off because she's a bully, but hey, she's the one that's gotten kidnapped so it's not like she's a genius. Unfortunately, those jerk plumbers go and rescue her anyway. It's a bad ending, but a great song! Link! He Come To Town! I guess here are some things to note. One, the song was sung by the band The Rabbit Joint in 1998, specifically a guy named Joe Pleiman. The original Flash video of the song came in 2001 by a guy named Josh Spaulding, and then various people made music videos of it after. One of the Internet's first instances of FAKE NEWS was that the music group System of a Down (an actually really famous band, though for the past two decades this story is the only thing I know them for) was responsible for the song. They weren't. Apparently, that impression was created through the peer-to-peer music pirating sites (like Napster, which has a Miiverse community for some reason) that existed back then. Something about SOAD being in the file name. You know, FAKE NEWS was actually more dangerous back in the early 2000s. There was a lack of resources you could trust (such as KoopaTV), and people actually forwarded chain e-mails to one another instead of deleting them on the spot. ALL of the songs in this article have some urban legends attached to them if you look. The song was already a classic pre-Flash video, being the 22nd remix on OC ReMix posted in 2000. Link! He Come To Town! (unofficial title) was very popular despite being pretty short and simple. If it was made today, I doubt it would get that kind of traction. Back then, new, catchy fan content was really rare and a big deal, and the fact that it was able to spread the way it did is a testament to how formative Flash was as a format in those early days. I believe that Link! He Come To Town! doesn't hold up as well to today's standards as Rawest Forest and Ignorance is Bliss do. You're free to disagree! If you have Flash content you particularly enjoy, let KoopaTV know! Eligible answers include all of KoopaTV's own games (while not OLD, they are all INSTANT CLASSICS), along with A Koopa's Revenge. Honourable mention (which is perhaps in its own category entirely due to it blowing everything else out of the water in terms of virality) is the All Your Base Are Belong To Us meme. Dude, I mentioned The Legend of Zelda in the article and you don't care? Rawk told me I shouldn't have even included that song. The mentioning of Zelda and System of a Down satisfies me. Where's that guest article on chairs? I thought you didn't want one because bird dude did one? When you say "bird dude" I think of Captain Vul, not Rawk. I do want one because gaming chairs is a good topic! I'd be more motivated if I were a staff member. Actually, you get rewarded in the KoopaTV Loyalty Rewards Program as a guest. You don't get anything as a staff member. So... if you can't do anything as a guest, you won't do anything as a staffer! I've already wrote a guest article though! (The most popular one even!) I am qualified. ...It's the most popular since it was written, not of all time. Also, it's only the most popular since it was written because one particular person kept viewing it over and over. It has the lowest ratio of page views to UNIQUE page views of any guest article since it was published. It was a well thought out article. It had truth and levity! It was real news sir. You're not going to be part of the staff when you're promoting the FAKE NEWS theory that one of your would-be coworkers doesn't even exist. ...When was the last time you actually saw her? Besides when you look in the mirror. A part of me doesn't believe that. I'll believe it if you hire me. Well, it doesn't matter to me if you believe it or not. You're only screwing yourself Truth points. The system is rigged anyways. The last few remnants of the golden era of the Internet are finally coming to an end. I remember when dial-up was the only option to be able to go on the World Wide Web as well when computers were pre-installed with games such as 3D Pinball Space Cadet. Today, these things are only memories of a bygone era and soon Flash will follow in their footsteps. H-Hey! Golden era and dial-up don't go together...!